2. Stir in Raspberry Flavor Packet with whisk until thoroughly dissolved. 3. Add Vanilla Soft Serve Mix to bucket. Stir vigorously with whisk until completely dissolved (about 2 minutes). 4. Add Tabasco and stir until completely combined. 5. 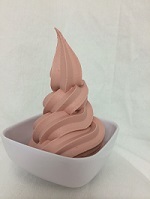 Pour the mixture into your soft serve machine or cover and place in refrigerator (reduce to 41°F within four hours).